Come oooooon 'Miserable night for France'. They weren't even playing a 2nd string side, what did anyone expect! Pointless two test matches. HUGE failure by the IRB and whoever else involved in terms of planning. Top14 final on at the same time as this little series. What a joke. Aussies scored some great tries, but you've got to feel for 'France'. I really don't agree with "miserable nigh title for France"
First : The season in France started on july 3rd 2007 and finished on july 4th 2008. The other I was reading an interview of Kelleher in a famous newspaper. He said he didn't expect such a long and hardseason (a game every week sometimes,2).French teams and players didn't hav a break for a year. That's really too much. Just look a Trinh-Duc after his try. It's obvious the only thing he thinks about is : "it's finally over". Second : Great thing mad by the french fedration : the final of the championship was the previous week. People in the french board are really too stupid. So we had to send a young (too young?) team. That's good because they will lead the french team in a few years but, for the moment, they'r not rival to Australian power. Third: As i said, French finished the season ans Asutralian were beginning the tri nations. Now about the game, of course France lost but if was an aussie I would feel strange. The asutralian scrum was pretty weak. 3 tried were scored because of naive french players. And when the french players succeded in putiting pressure on australian backs, it was ach time a handling error. What to expect against the blacks? I don't know. As Sharky said, these test bcome pointless. We urgently need to do something if don't want these game to become boring, meaningless. what's the song they play after they score a try for the Walabies when they are at home? I feel sorry for french players who played as hard as they could and come home with such an upsetting result. Im' the anonymous who posted before dave. I agree with Ulf (not only coz I'm french) but it's true team was very young. Trinh Duc who is 21 years old and who has 6 caps was the most experienced player in the backline. I expect a bright future for us too. 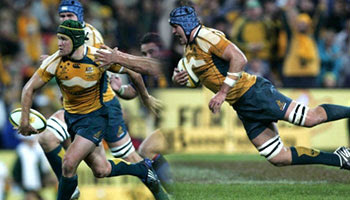 giteau is truly a worldclass player!! Wallabies didn't look convincing despite what the scoreline might suggest. Hopefully their game against South Africa will be entertaining. i just love this reverse pass from giteau (2nd try) very classy! IRB should think about the programmation of these North vs south tests. Anyone know what Ulf is referring to there? ^^^hes refferıng to when Pallıson pulled down Lotes pants by accıdent and then chabal was gıvıng hım all hell for ıt after the match sayıng stuff lıke you shouldnt have done that Lote ıs much bıgger than you!! Hmmm.. so this guy is requesting a video of lote tuquri getting his pants pulled down... Okaaay. Now, it seems that, for their first encounter on the field, Palisson was really too fast for him.